I have wanted to play with chocolate and chilli for a while and I thought that there would be no better time than Halloween – bonfire season. The nights are drawing in and it’s getting cold, so why not divulge in some chocolate with a little heat! 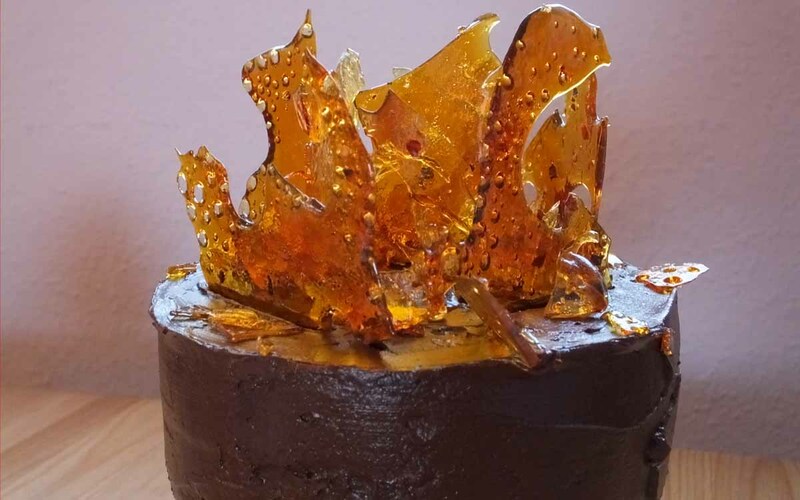 To give the cake that added bit of visual drama and theatre, I made some shards of caramel with fine strands of red chilli and dried chilli flakes in it. 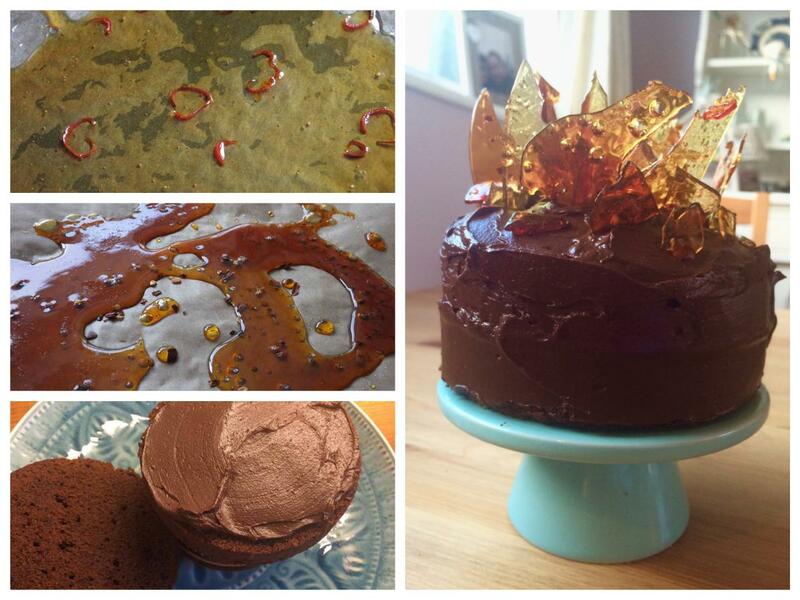 Adding a mixture of dark and light brown sugars brings a balance of richness and lightness to the cake. Pre-heat the oven to 160C (140C fan oven) and grease and line an 8″ round cake tin. Break 200g dark chocolate into a bowl and place over a pot of simmering water, making sure the water doesn’t boil or come in to contact with the bowl as this will cause the chocolate to become lumpy. Once melted, remove the bowl from the heat and allow to cool slightly. Using an electric mixer, cream together the butter and two brown sugars until light and fluffy. Beat in the eggs one at a time to the batter and add the cooled, melted chocolate and stir through. Now add the plain and self-raising flour and beat until smooth. Chop the red chilli very finely and add to the cake mix stirring through evenly. 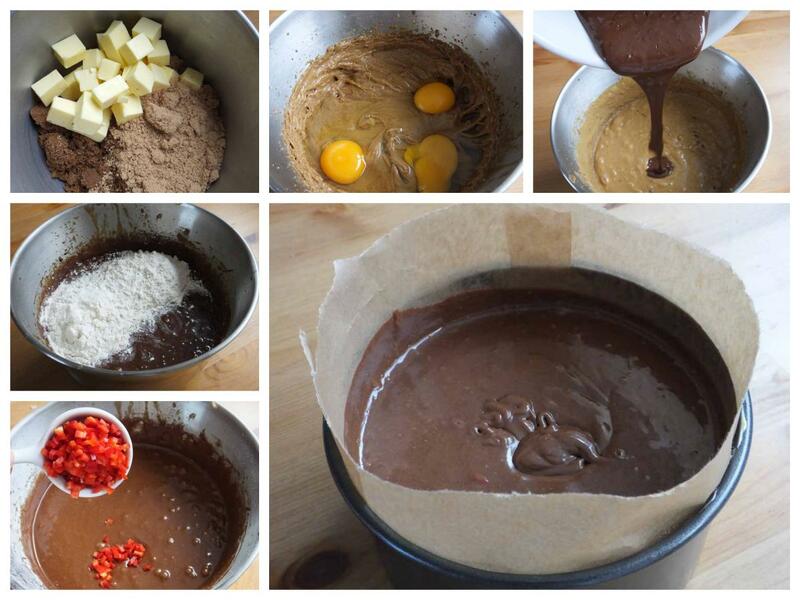 Pour the cake mix in to the prepared cake tin and place on a baking tray in the centre of the pre-heated oven. Bake for around 1hr 30mins – 1hr 45mins checking that the cake is bake evenly by testing with a skewer. The cake will rise slightly and form a thin crust. Once cooked through, remove the cake from the oven and allow to cool in the tin for 10 minutes before taking it out of the tin and cooling on a rack. Line a baking tray with greaseproof paper and lightly oil. Scatter half the baking tray with finely sliced fresh chilli on one side, and dried chilli flakes on the other. Add the sugar and cold water to a saucepan over a medium heat and allow to simmer. You may want to occasionally shake the pan gently, but do not stir! Leave the caramel to become lightly golden, making sure it does not burn, and lift the caramel off the heat. Drizzle half the caramel over one side of the baking tray, tipping the tray to encourage irregular shapes. Now return the rest of the caramel to the heat and allow the color to deepen slightly – this should take less than 60 seconds so be sure to keep an eye on it as it could easily. Pour the darker caramel over the other side of the tray, creating two toned caramel. Tip the tray once more and set aside to solidify. Once the cake has cooled, slice it in half and begin to prepare your ganache (if the cake has a high middle you may want to slice a little off the top). Melt a further 200g of dark chocolate over a pot of simmering water and once melted, allow to cool slightly. Add the double cream and stir. 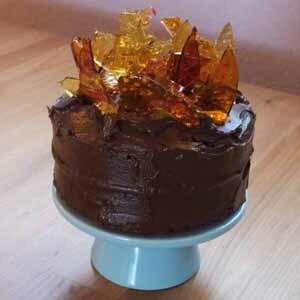 Spread a little of this ganache mixture over one half of the cake using a pallet knife, and place the other half on top. Turn the cake upside down so that the flat bottom is to the top and spread the rest of the ganache over the top and sides of your cake. You do not need to worry about making the cake perfectly smooth. Allow to set. 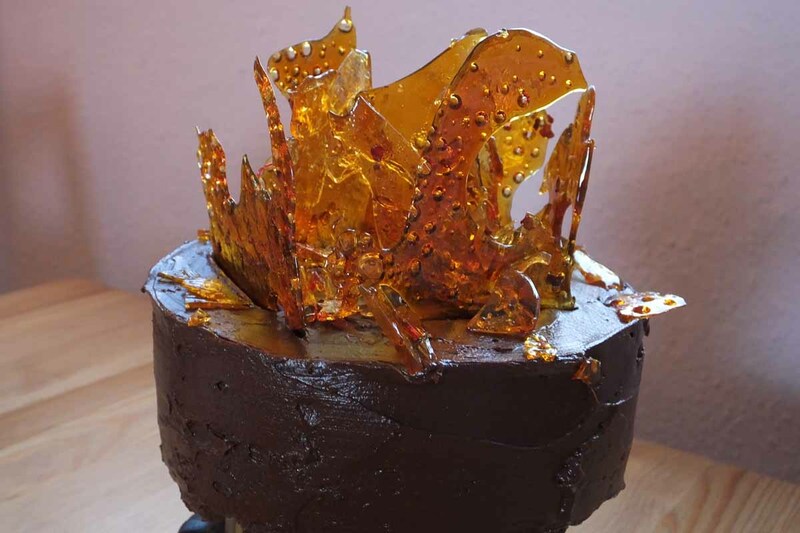 Break the caramel in to large shards and push them into the top of the cake to create a bonfire effect on top of the cake. Once you are happy with the shape of the bonfire, smash some of the leftover caramel into small pieces and sprinkle over the cake. Place the cake on a serving plate and enjoy. You can keep the cake in an airtight container but it is best enjoyed within 24 hours of assembling as the caramel may begin to melt slightly. 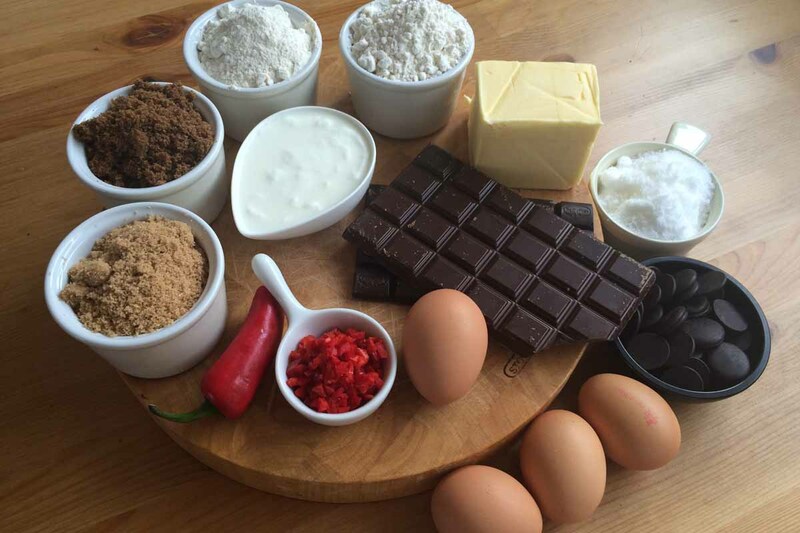 Are you a fan of chocolate and chilli or do other flavours tickle your fancy? Let us know your favourite chocolate cake combos by commenting below or connecting with us on Facebook and Twitter. You can also connect with us on Instagram to keep up to date with some of our latest creations.